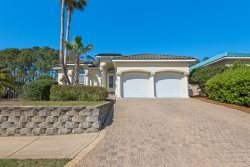 This magnificent Mediterranean style home has all the amenities you would look for in a vacation home, close to the beach, close to shopping and restaurants, and located in an upscale beach neighborhood. Stir up a batch of Margaritas and enjoy them on the comfortable back patio overlooking the private pool and its lighted waterfall. Experience priceless family memories, and perfect your grilling technique on the patio BBQ. A big home, there’s ample room for all, friends, children and pets. All will love the fenced yard. Your master suite, on the main floor, includes a separate living area & private bath. Both guest bedrooms have their own private bath and private balconies (with partial gulf view). This is a lovely home that is exceptionally clean and well maintained. The team was great! We had a low tire on the golf cart and I texted to let them know. In less than an hour it was fixed! Great place to spend time with your family! The layout of the house was perfect for us. One of my sons and his family stayed in one room, with the King size bed and bunk beds and then my other son and his family stayed in the other room with the queen size bed and bunk beds. This left us with the Master downstairs that had a nice sitting area and a place to relax if needed. Everyone had their own bathroom and it was just a perfect set up. The owner came over to meet with us and give us the keys to the golf cart he was very friendly. It is well maintained and has all the luxuries of home we had plenty of room and it was so nice having our own room and bathrooms and having a washer and dryer so we didn't have to bring dirty clothes home the pool was a plus the kids were able to relax after a long day at the beach. WONDERFUL TIME!!! we will be back!!!! soon! I was so impressed with quick response to my 2 calls. One call turned out to be a false alarm - no gas in grill at 6pm. Rick's text reply acknowledging my call was a relief and the actions to resolve was very helpful. Luckily, it was only a faulty ignitor and supper was on track. I appreciated the follow up and email letting me know my deposit refund is being processed. Saved me a phone call and gave me opportunity to share my comments. Golf Cart available for use please call for pricing details.